The 13th International Exhibition & Conferenceon Pulp, Paper & Allied Industries in Pragati Maidan, New Delhi INDIA from 1th~4th November, 2017, and today is the first day of exhibition, Leizhan as a professional paper machine manufacturer, we attend this exhibition to exchange technology and experience with paper making friends. Paperex is an internationally renowned series of exhibitions and conferences focusing on Paper, Pulp and all Allied Industries. This is 13th International Exhibition & Conference on Pulp, Paper & Allied Industries in Pragati Maidan, New Delhi INDIA from 1th~4th November, 2017. 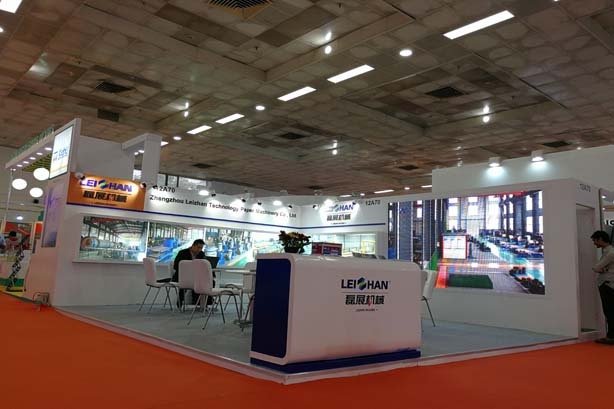 Leizhan Manufacture Paper&Pulp Machine for more than 37 years, the technology is continuously upgraded to meet the market requirements, we summed up the production line of experience to improve the machine to get more production efficiency. This time our manager and engineer attend this exhibition, if you have any need or questions, welcome to our booth to consult us.